Rarely can it be said that a new golf course development is truly different. Riverdale, carved into a valley deep into the historic Chao Phraya River Delta, may be the exception. 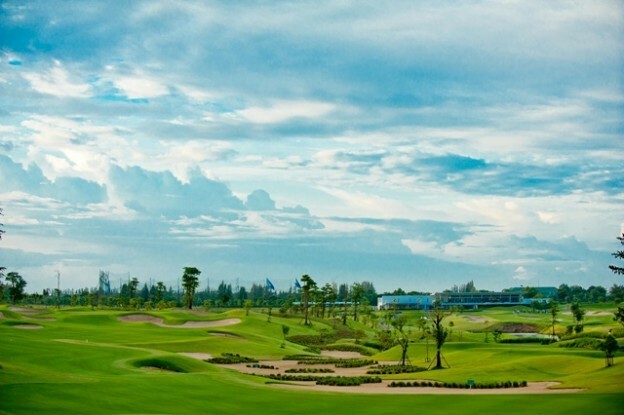 Design partners Jon Morrow and Al Tikkanen have crafted an intriguing challenge featuring ‘up hill and down dale’ golf never before seen in the Thai Capital’s predominantly flat golf landscapes. Several holes feature play from elevated tees to fairways laid out in valleys below. Forested hills and waste areas with native grasses frame the most clearly visible golf holes in Bangkok. Nature will play its part – pockets of wetlands create wildlife havens and perhaps a new habitat for Open Bill Ibises which traditionally migrate annually from as far a field as India, Sri Lanka and Vietnam. Continuing the ‘eco-friendly’ theme, Riverdale features Salam Paspalum on tees and fairways, and the latest ‘ultra-dwarf Miniverde’ on greens. The course is not long, but variety is stressed at every corner. Multiple tee locations offer a challenge for all levels. Playing strategies are defined by numerous hazards from sprawling white sand faced traps and deep sod walled pits to sandy wastes dotted with dune grasses. The Design favours intelligent play, with risk and reward options presented boldly, or subtly, on most every hole. Riverdale welcomes discerning golfers to enjoy a strategic new golfing challenge, 5 star service and immaculate playing surfaces.